Ian Jenkins, CEO of Frelii Inc. (OTCQB: FRLI) ("Frelii" or "The Company") met in an informal meeting with Canadian Prime Minister, Justin Trudeau to discuss how Frelii's artificial intelligence (AI) technology could be beneficial in advancing the safe and more effective use of medical cannabis products in Canada. 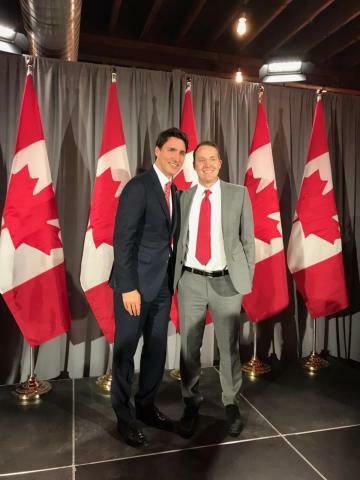 "This was our first opportunity to meet with the prime minister," said Ian Jenkins, CEO of Frelii Inc. "Frelii has been working with regulatory officials and physicians in Canada to prepare to deploy our AI technology there. It is designed to enable medical professionals and their patients to use cannabis products, such as CBD, more safely and effectively than the current, trial-and-error approach." "It is my opinion that Canada would be an ideal epicenter of initial wide deployment of our technology," Jenkins said. "The environment is primed for expansion as the government was the first to deregulate the whole CBD space. We will be able to grow in an environment where the regulations support the expansion of a responsible approach for the safe consumption of cannabis products. Mr. Trudeau said he was encouraged that Frelii was going to deploy its technology there and opened the door for introductions to the miniser of innovation, science and economic development, Navdeep Bains." Frelii Inc. is a medical technology company that uses gene sequencing and artificial intelligence to determine risk and lifestyle modifications. Its technology analyzes the most comprehensive markers (60,000,000+) on the market to date. Frelii's technology generates accurate and profoundly valuable insight into DNA. It opens opportunities never before realized in health care, precision medicine, insurance, corporate wellness as well as personal health and risk identification. For more information, please visit www.frelii.com. Frelii (OTCQB: FRLI) trades on the #OTCQB Venture Market for early stage and developing U.S. and international companies. Companies are current in their reporting and undergo an annual verification and management certification process. Investors can find Real-Time quotes and market information for the company on www.otcmarkets.com.